Set in New Orleans, Walker Percy’s 1961 novel The Moviegoer is steeped in a sense of the collective culture and customs of the American South. Similarly, much of the work of photographer Jared Ragland is rooted in his lifelong exposure to the landscapes, people, aesthetics, and storytelling traditions of this part of the country. 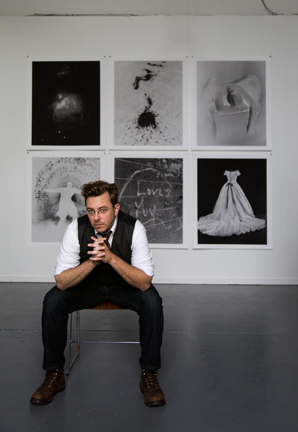 A native of Birmingham, Jared attended LaGrange College in Georgia before pursuing his MFA in Photography at Tulane University in Louisiana. After eight years of living in Washington, D.C., where he served as Photo Editor for the White House under both the Bush and Obama presidencies, Jared returned home. He is currently the Visual Media and Outreach Coordinator for the Department of Art and Art History at the University of Alabama at Birmingham, where he also teaches photography. 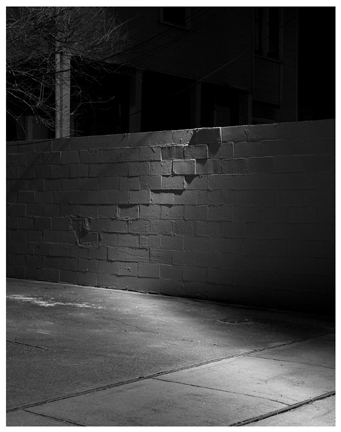 Jared’s work is imbued with his personal history and identity of place, and many Southern viewers will find something recognizable in his photography. From the pictures of wounded soldiers presented with a tinge of Romanticism in War Journals to the use of arcane material from the Smithsonian archive, Ragland’s appropriation of identifiable imagery makes his digital collages immediately accessible to his audience. In work where his content is completely original – like the black and white documentary photographs taken at home and abroad – the viewer recognizes archetypal landscapes, characters, or moods. While the familiar does provide a point of entry into Ragland’s work, as the subtext of Aunt Emily’s line in The Moviegoer quoted above suggests, the context or combinations in which the images are presented reveals alternate, more nuanced meanings. It is the search itself, rather than arriving at some certainty, that fascinates Binx Bolling, the main character in The Moviegoer. Likewise, it can be said that Ragland’s goal as an artist is to encourage viewers to journey toward an understanding of his work based not only on observation, but also on self-reflection. Jared takes the commonplace and recontextualizes it in conceptual narratives that require contemplative analysis and deep viewing practices. Often fluctuating in feeling between intimacy and distance, private and public, realism and metaphor, the duality present in Ragland’s work is enhanced by his art-making technique, which combines the technologically advanced with the handmade. 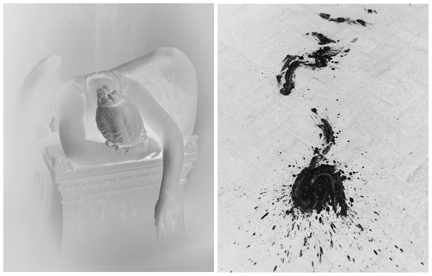 For instance, in his forthcoming book Everything is Going to Be All Right, Jared employs both traditional black and white photography as well as appropriated imagery that was digitally sourced to produce a meditation on Percy’s The Moviegoer that dissolves boundaries of space, place, and time yet maintains a consistent emotional sensibility. A large portion of Ragland’s other work likewise incorporates images from online archives, electronic photographic databases, and Google image searches. This is yet another way that Jared challenges traditional notions of authorship and artist agency: by borrowing images from the past and combining them with his own photographic production. The result is a body of work that, like Birmingham itself, has deep historical connections yet is simultaneously cutting-edge and contemporary. – Essay by Catherine Wilkins, Ph.D. If you’d like to learn more about Jared and his work, visit his website. Click here to check out MCAC’s blog announcing Jared ‘s selection as the 19th recipient of Magic City Art Connection’s Emerging Artist Award. Find Jared at the Festival on April 24-26 in Booth 120 on the Fountain Walk adjacent to the Info Center Gazebo.